There's an interesting article on Engadget looking at why B5 has been left to look so bad on Amazon. A couple of interesting tidbits that were new to me, at least. The author spoke to John Copeland, who confirmed what JMS said about the show existing on pristine 4:3 film reels in a WB warehouse somewhere that could be used to transfer to higher-resolution (though he's careful to state that it wouldn't be as good as true hi-def, but leagues better than what we have at the moment). Copeland also says that the original plan for converting the effects shots to higher-def widescreen was to be done with something called Teranex, which would have successfully upgraded the FX shots at a cost of $1200 per episode, but WB didn't want to pay even that for the DVDs. He also explains a little bit more about why Foundation Imaging stopped doing the effects after season 3, because Ron Thornton had asked for an extra $100,000 to do Severed Dreams. Sounds like the producers met his demands that time, but were worried he'd do it again and hold the show to ransom, so they parted ways. Maybe we need to follow in the footsteps of fans of The Expanse – they got Amazon to pick up the show after a concerted campaign aimed at Jeff Bezos, including hiring an airplane to fly over Amazon HQ trailing a message. Bezos was speaking at some conference somewhere in front of engineers and scientists when he announced that Amazon Prime would save The Expanse, and sounded quite excited about it. If The Expanse hopefully does well for them, maybe he'll be looking for other SF shows to give a new life to. Anyone want to hire an airplane? I'm afraid I look at that bit askance and simply note that Copeland was on the Board of Directors for Netter Digital which later declared bankruptcy and took the B5 Fan Club down with it. His is hardly an unbiased view. And Ron Thornton's no longer around to dispute it. Is it really that controversial? JMS always said that the split from Foundation was monetary and being unwilling to meet their terms. Severed Dreams was a big episode and undoubtedly cost a lot. It stands to reason that the producers would be concerned about increasingly larger bills from Foundation whenever a big episode hit. Imagine how much they'd have charged for Endgame. Anyway, that was only a minor part of the article. The most interesting part to me was about the Teranex. A lot of people suggested JMS was wrong when he said there were film reels of all the episodes, Copeland says he's correct. The most interesting part to me was about the Teranex. A lot of people suggested JMS was wrong when he said there were film reels of all the episodes, Copeland says he's correct. Yes that is definitely the most interesting part. It makes it sound as if there is hope. Suffice to say that there was a major conflict of interest there. Ah, I see what you're referring to now. Since I have zero facts about that particular allegation, I'll bow out of that part of the discussion. Still, it's interesting to know that it cost an extra $100,000 to do the effects for Severed Dreams. The average budget per episode for the show was about $800,000 wasn't it? 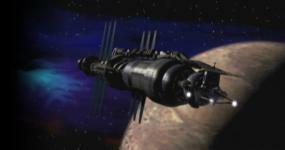 It shows how ambitious an episode that was, and gives some indication of what the special effects cost. Season 3 in particular was very effects laden compared to the previous two seasons, I always wondered how they budgeted for it. When it comes to Amazon and The Expanse, Jeff Bezos was actually a huge fan of the show and was rather annoyed that they didn't have the rights to it already. So we've got to get him to watch B5 I guess. Yeah, he’s lying in some attempt to cover his backside, and it’s a pretty outrageous (and rather silly and unnecessary) thing to do at this point. When putting B5Scrolls together we talked about the split as well and all I’ll say about that is he didn't dare to try and come out with that sort of nonsense as he knew that folks like Thornton were also contributing to the site. He knows what happened, and what part he played. Hell, even jms has come out and said that the split with Foundation Imaging was something that was orchestrated by Doug Netter. . . . and John Copeland played a big part in that as well (basically they’d spent a while creating conflict between jms and Foundation, and jms then unwittingly passed the lies he was being told onto fans when explaining the split. . . .). It *was * about money though, Netter wanted the FX budget for his own company. Here's what jms said a few years back. I’m very disappointed that Copeland is using Thornton's passing as an opportunity to come out with that complete crap about holding back FX shots unless he got 100,000 dollars and that's why Foundation had to go. Sigh – it’s ridiculous. What it illustrates though, is how blatantly fans can be lied to by producers like Copeland in order to try and influence perceptions, and rewrite the facts. As for the Terranex thing, that’s not new news. . . . It’s on the B5Scrolls interview, as is most of what this new article reveals from Copeland. On this new article he also doesn’t say that there’s a film copy of the FX. That article is very confusingly put together with quotes and commentary from the author being intercut. What Copeland says (and which is completely correct) is that upres’ed copies of the FX can be dropped into any rescanned film of the live action. It’s two separate processes. Emphasis added by me. "This company in Sweden, called Teranex, were way ahead of the curve in knowing people would need to upconvert standard def to high definition." Warners owned a Teranex box, and the idea was that, eventually, the 4:3 CGI sequences would be upconverted and integrated into the 16:9 footage. John Copeland confirmed this, saying "They [Warner Bros.] have everything they would need, except for the pilot." (That's because the warehouse where the materials for the 1993 pilot movie The Gatheringwere stored were damaged by the Northridge earthquake.) "They could go back to the negative and, assemble the negative and re-transfer it in HD, and all they would have to do is upconvert the VFX footage and drop it into the holes." Last edited by Triple F; June 29th 18 at 10:16. But very informative. I sure wish I had a time machine. I really hate it when stuff like this happens. So to clarify, are you saying that he is now trying to re-write history to cover the fact that it was all about making money now that the two top people involved in the incident are no longer with us? I put it that way because you pointed out that JMS felt like he was manipulated. See Triple F this is one of those times when you really need to ask yourself, "Do I know too much?" In all seriousness though, this is a prime example of why I fear learning too much about these people and what happened. I want to live in the bliss of thinking everyone who made Babylon 5 is perfect and Warner Brothers is the villain despite the fact that I own many of their movies and I worship TCM (I know WB doesn't have that much to do with TCM, but it is enough.) I know it isn't reality, but my reality is that I love B5 and learning the continued imperfections of those who made it makes me question opinions I've had in the past. Maybe WB isn't the villain? Maybe WB simply reacted to Netter or Copeland when it came to issues with the show? Maybe WB didn't like dealing with them so they didn't want to go all in with spin-offs and straight to DVD releases? Maybe JMS is on an enemy's list on the Warner backlot and it has been set in stone that they will never give up their stake in B5 if it means he can do something with it? And maybe it is just all about Mira Furlan? OMG! I just got soooo sad because I wanted to write "Stephen Furst" as the name in that joke. I was trying to think of the actors who likely created the least amount of issues for the show, when speaking of issues they could control, and those were the first two names that popped in my head. I mean I don't know them, but in my imagination I see Mira and Stephen as two of the actors who likely did their jobs and didn't ruffle too many feathers. It is a complete product of my imagination based only on a few things I've read and two VERY brief encounters with both individuals. DON'T RUIN IT!!!!! I do appreciate the truth. In this day and age Copeland should know better. At least he should have worded things better. Maybe he genuinely had a real issue dealing with Foundation, but he definitely had something to gain from the change and he should always consider that people know that fact and be upfront about it. If there is one thing we all have come to learn it is that many lie to the public and those lies are revealed pretty quickly. The sad thing is how many don't care that it is a lie or deny that it is a lie. And now I am off on a different tangent. You’ve no idea. And yeah, in many ways I really wish I never started that learning exercise in how to code up a basic web page. You can most certainly learn too much, and it can be a bad thing especially if you make the mistake of telling fans who believe something else (It’s why - after learning that lesson - I don’t post much on forums as the urge to correct some of the many, and often repeated misconceptions is stronger than it should be). It’s why I’ve also held back on the content of B5Scrolls – there’s stuff even I wouldn’t share, and that’s before you get to the off the record bits. . . . but I’ll throw this out there. . . . . . . On second thoughts, no I wont – this is neither the time nor place. (but check out who was the THIRD named recipient of the emmy for the visual FX - besides Bryant and Thornton - and who doesn't get mentioned anywhere on the published version of B5Scrolls – I’m surprised no one ever asked about why that is). You need to scroll down a bit to find jms’s comments, then a bit more to see Thornton’s response. But basically jms was being told that FI was blocking the two guys who stole the 3D assets from FI’s servers in order for Netter to get hold of them (as Babylonain signed a contract that only gave them rights to the FX shots, not the 3D models) from joining the academy . . . What jms wasn’t being told was that they’d grossly overstated their experience and that’s why they got knocked back. . . . . That sort of whispering in his ear helped prolong a feud which they created just to get hold of the FX budget after Thornton and Bryant declined Netter's deal when he tried to take control of FI. One of the bits many fans don’t realise – and which might help explain a few of the things some have wondered about - is that Netter was NOT an equal partner with Straczynski, Netter was the senior partner – owning 51% of Babylonian Productions, and he was an experienced Hollywood player, while Joe was a relative newbie (at that level of game play at least). Anyway. Again, This is neither the time nor place, and I only brought up the details in the original post because Copeland REALLY shouldn’t have made a ridiculous (and stupid) claim like that. He was well out of order. As for why he’s making comments like that at this late stage – bugger knows exactly why. But Producers are *very* political animals as well as business is business, and in Hollywood reputation is everything. But even if one person believes it then they can raise doubts to others whenever the topic is discussed – and raising uncertainty like that (no matter how ridiculous) is common when it comes to mass media, and it’s manipulation. Someone will always believe it, and why wouldn't they if no one tells them otherwise . . . . . It does have it’s funny side though, I’ve got this image of Thornton holding a gun to a computer and threatening to blow its brains out if they don’t come up with the cash and a fast plane to Cuba. Last edited by Triple F; June 29th 18 at 17:51.